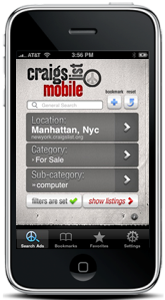 CraigsMobileList is a simple and intuitive application designed to greatly improve the ease of searching, browsing, and responding to Craigslist listings on an iPhone. By streamlining the interface, CraigsMobileList makes Craigslist as quick and effortless to browse and search on the iPhone as it is through a standard browser on a computer. ∙ Forget about resizing screens and clicking on tiny links!